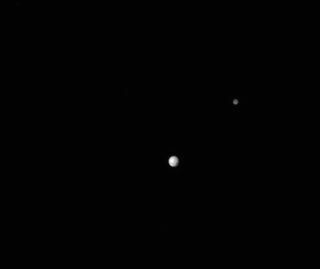 Pluto and its largest moon, Charon, were captutred by NASA's New Horizons spacecraft on June 29, 2015, at a distance of 11.3 million miles (18.2 million kilometers). A NASA spacecraft is less than two weeks away from a historic flyby of Pluto that will cap a nine-year trek across the solar system. NASA's New Horizons probe will cruise within 7,800 miles (12,500 kilometers) of Pluto's surface on July 14, capturing the first-ever good looks of the frigid, faraway and mysterious world. The $700 million New Horizons mission launched in January 2006, tasked with performing the first-ever up-close investigation of Pluto. Scientists haven't learned much about the dwarf planet since its discovery in 1930. Because Pluto is relatively small and so far away from Earth — about 3 billion miles (4.8 billion kilometers), on average — the object remains a blur of pixels even in the best photos by NASA's powerful Hubble Space Telescope. But New Horizons is lifting Pluto's veil. Observations by the piano-size probe during its approach have already revealed previously unseen surface features on Pluto, including extensive light and dark patches and a possible ice cap at one pole. The photos, of course, will only get better. During the flyby, New Horizons' cameras should be able to resolve features as small as the ponds in New York City's Central Park, mission team members have said. New Horizons also will use its seven science instruments to map the surface composition and temperature of Pluto and Charon; characterize the atmosphere of Pluto, as well as the geology of Pluto and Charon; and hunt for rings and additional moons in the Pluto system (a task it's already performing). In short, the spacecraft will take Pluto's measure for the first time. And Pluto may not be New Horizons' only destination. Mission team members have proposed sending the probe on to study another object in the Kuiper Belt, the ring of icy bodies beyond Neptune. If NASA approves and funds this extended mission, New Horizons would likely fly by this second object in 2019.